Live in or near Shepherds Bush, London W12? We carry out Velux (roof light) loft conversions and dormer loft conversions and are happy to offer advice and guidance at no obligation. When you choose Ash Island Lofts our goal is to offer quality loft conversions in Shepherds Bush, from concept through to completion, for the wide spectrum of client needs and tastes. 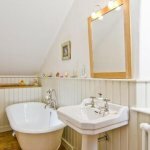 Our experienced loft conversion tradesmen are experts in their respective fields, so you can be assured your Shepherds Bush loft conversion will be carried out to the highest standards. Unlike most other loft conversion companies, here at Ash Island Lofts, we guarantee our work for 10 years and this is underwritten by The Consumer Protection Association who will fix any defects in the unlikely event we are not around to do so. To see further information visit the The CPA website. When you chose Ash Island Lofts we offer loft conversions for Shepherds Bush from design through to completion - this includes planning, building regulations, structure, stairs, Velux widows, dormer windows, insulation, plastering, heating, plumbing, bathroom fitting, electrical work (Part P) and woodwork, etc. However, if you would prefer to do (or manage) some of the '2nd fix' elements yourself then we can tailor a package to suit your needs. A dormer is an extension to the existing roof, allowing for additional floor space and headroom within the loft conversion. Dormers protrude from the roof slope, normally at the rear of the property and can be built in a variety of styles. Internally, a dormer will have a horizontal ceiling and vertical walls compared to the normal diagonal sides of a conversion. In lofts that have limited space or headroom a dormer will provide additional space that can make a conversion feasible. Flat roof dormers tend to give the maximum amount of additional internal space although they do not look as attractive from outside the property. Gable fronted and hipped roof dormers look much more attractive but they often do not give as much internal space and will cost more to build due the extra complexity. A Mansard roof has two slopes, the lower slope is close to vertical at 72 degrees and the top section of the roof is almost horizontal. This style of roof is named after a 17th-century French architect Francois Mansart (1598-1666) who used this design of roof on many of his buildings. A Mansard roof has the advantage of maximising the available space within your loft. Mansards are commonly built by raising the party/gable walls either side of your house to make the profile for the Mansard and then creating the timber frame. Although common on older properties, especially in cities like London, Mansards are not often seen in the suburbs. Flat roof dormers tend to be a more popular choice for the 'average' 3 bed semi or terrace house due to the reduced cost and simpler construction. A Mansard loft conversion will almost certainly require planning permission. Things definitely worth considering. While this type of roof will give you the maximum amount of space in your loft conversion it does have a downside - as it involves replacing the entire roof the construction costs will be high. Therefore, it is quite unusual to see this type of conversion, unless the original roof was built in this style. Velux and roof light conversions are the same with Velux being a brand name. This type of conversion is generally very cost effective, is quick and simple and in most cases it does not require planning permission. Roof light Velux windows are easy to install and normally only require one of the existing rafters to be trimmed out per window. The Velux windows are installed to fit flush with the line of the roof and leave the existing roof structure untouched. As they do not require extensive alterations to the roof this option helps keep the cost of the conversion down. As the loft is not extended beyond the original roof line planning permission is not normally required (you should still check with your local planning department before proceeding with any works). A Velux type loft conversion works very well for lofts where there is a good amount of headroom or if there are constraints on planning, for example if you live in a conservation area. If headroom is going to be limited then either a dormer or mansard conversion may be a better option. Velux roof lights can be fitted quickly and easily meaning there is minimal disruption or delays due to bad weather. As Velux windows are installed at the angle of the roof rather than vertically like a normal window they can let in a surprising amount of light. While this is great during the day and will give you a light and airy room it can become a problem at night or in the summer. Window blinds are available from various sources tailor made for Velux windows that perfectly fit into the window frame. You can even get blinds that have a thermal silver backing, great for retaining heat in the winter and keeping it out in the summer. Contact Us for your free advice and consultation... but only if you are serious about making more of your home in Shepherds Bush, please!